Samuel K. Labatt was born in North Carolina in 1830. As a young man he traveled to New Orleans where he was an officer in the city’s Hebrew Benevolent Society. He arrived in Los Angeles in 1853 with his brother, Joseph Isaac Labatt. Samual Labatt opened a “fancy” dry goods store called La Tienda de China. 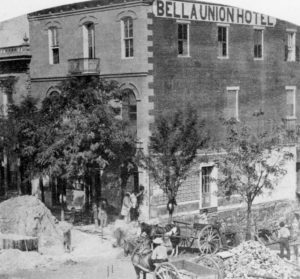 It was located on the Southwest corner of Main and Commercial Streets, near the Bella Union Hotel. When Solomon Carvalho, another Sephardic Jew, arrived with the Fremont Expedition in 1854, the Labatt brothers and Carvalho joined together to help solve the problem of the lack of Jewish organizations in the Los Angeles. The result was the Hebrew Benevolent Society, the first non-Profit organization chartered by the City of Los Angeles. Samuel Labatt was its first President. Today, the organization survives as the Jewish Family Service of Los Angeles. From 1853 to 1854, Samuel Labatt was sergeant in the local militia. In 1855 he was appointed Commander of the Ringgold Light Artillery. When the company became a part of the city government, Labatt retained his command. The Labatt brothers left Los Angeles in 1855, for San Francisco. Samuel later moved East to Galveston, Texas. 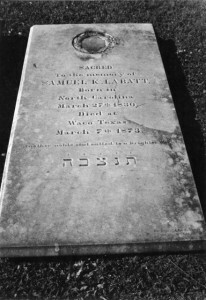 Samuel K. Labatt died in Waco, Texas in 1873. Norton B. Stern and William M. Kramer, “Sephardic Founders of the Los Angeles Jewish Community: Samuel K. & Joseph I. Labatt,” Jewish Museum of the American West 28/4. William M. Kramer and Norton B. Stern, “Samuel K. Labatt: Sephardic Founder of the Los Angeles Jewish Community, 1830-1873,” Western States Jewish History 38/3&4. Norton B. Stern, “Final Resting Place of Los Angeles Jewry’s First President,” Western States Jewish History 18/4.